Walter Bagehot cannily touched upon the cornerstone of monarchic durability when he noted that it was the institution’s mystique; its protection from ordinary human concerns and the fantasy that its above politics, that made it. “We must not let in daylight upon magic,” he wrote, and all he meant by that was “don’t pull back the curtain”, because doing so would be like that reveal in The Wizard of Oz; it would bring the sovereign down to our level with an egalitarian thud. Once there, what need would we have of him or her? Two thirds of us love the Queen, say the polls, precisely because she’s not one of us: she’s above vulgarities like direct representation and social change. She’s reassuring continuity for subjects bred to distrust the ambitions of their peers: a nation of inverted snobs that make a notable exception for a family of hereditary millionaires. Peter Morgan’s new play sells its audience a few juicy fantasies. It imagines daring to pull back that curtain a little and shining some daylight on the weekly collision of elected representative and unelected monarch that is the Prime Minister’s twenty minutes with the Queen. It speculates about what she might be like in a private setting, permitted to be flesh and blood. It dreams about her interactions with picks from the twelve PMs she’s hosted since 1952 and what she might have thought of them, and all this while carefully retaining the reserve, the aloofness, that we expect of her, in a bid to satisfy our curiosity without shattering our cherished illusions. It’s not an easy gig but Morgan’s balanced it beautifully. He’s invested Helen Mirren’s nuanced and well-worn Monarch with a rapier wit and a closet sympathy with the left, borne of affection for Harold Wilson. It is, in short, a well-calibrated fancy; the kind of PR that Elizabeth herself would applaud. You exit this production feeling you know something of her formative years, her personality; it’s a magnificent illusion. Morgan’s poured magic upon magic and convinced the crowd they’re looking at daylight. The Queen is ontologically ideological but somehow politically neutral; that’s the lie that allows the institution to continue unchecked. The play can’t afford to adopt such neutrality, primarily because it’s about how successive politicians have impacted upon and shaped this thing that’s allegedly separate from Westminster and its auspices. Morgan’s read the runes and built on innuendos from the archives to take a stab at Liz’s political bent. The Audience‘s audience must remain attuned to the playwright’s bias – that this is his imagined, possibly desired interpretation of history. We should be suspicious of Haydn Gwynne’s cold, opportune Thatcher, berating the Queen for a rare political slip; a 1986 briefing to the Sunday Times; – a Mrs T that repeats the infamous “there’s no such thing as society” mantra that shorn of context was appropriated as shorthand by the left in a bid to caricature the Iron Lady and her dispassionate policies. We might also wonder if Harold Wilson was quite the earthy, good humoured man that Richard McCabe breathes life into; a mass of plausible contradictions – a deferent prole with the socialist needle. Are these stark oppositions fundamentally true or artistically revised? It’s clear where Morgan’s sympathies lie and yet, despite such crude simplification, his play seems to capture the raw essence of those prime ministers selected; the siege mentality of Gordon Brown, the intellectual insecurity of John Major, Anthony Eden’s old guard imperial gentleman, Churchill’s knowing mix of paternalism and conservatism; his sense of history. David Cameron, somewhat tellingly, feels the least substantial – a PM whose character amounts to little more than a star struck courtier; an unfailingly polite void whose only impact on the Queen is showing her how to use her mobile phone. These are mere impressions but they feel authentic: something less than a character but more than a caricature. 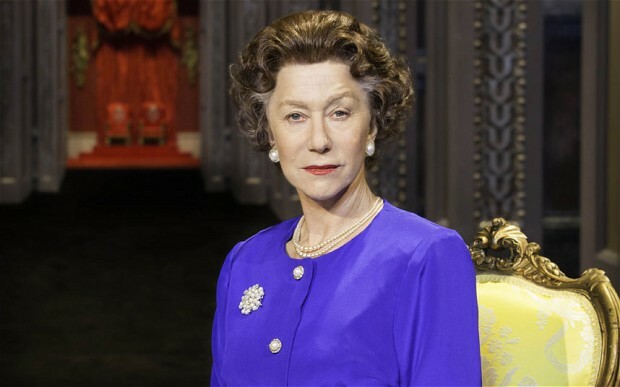 All the while Mirren inhabits her role with great subtlety, plausibly portraying Elizabeth from her twenties to her eighties with barely perceptible shifts in vocal pitch and posture. The device of a younger Elizabeth interacting with her older self gives Morgan the space to profile his subject – her breeding, her sense of duty, how any political leanings she may possess were shaped by her formative experiences. This is particularly effective in her clash with Thatcher over trade with South Africa: the Queen as not just the embodiment of history but its witness and champion. Considering how little we know of her as a human being, how much we’re required to infer, Mirren’s performance; dimensional, funny and touching; is all the more impressive. She’s as close as the common man can hope to get. We’re given a sense of a woman trapped in a role she never wanted, driven by obligation and frustrated by her inability to shape events. This is responsibility without power; privilege without political purpose. The Queen’s duty is to be the Queen and be mindful of what government is doing in her name without interfering in that process. Morgan’s play manages to bring that relationship into sharp focus and though ultimately deferential to the institution it explores, despite the pretence that it’s the office of PM that really counts, it succeeds in illuminating a juncture at the top of British public life that is hidden from view. Accurate or not it’s a magisterial night in the theatre. The Audience runs at the Gielgud Theatre, Shaftesbury Avenue, until June 15th.